Released last month as part of Shout! Factory's Shout! Select line (only available through their website) is another sought after episode of the classic series Mystery Science Theater 3000. Originally released on VHS and DVD from Rhino way back in 2001, this episode is finally available again on DVD. This episode starts out with a short entitled Cheating, which isn't about adultery but about cheating in school. We meet a boy who realizes that he'd rather cheat then study and ends up bringing his friend down with him. After he is caught, he realizes the repercussions weren't worth the risk. After the short we are treated with the excremental classic The Wild World of Bat Woman. 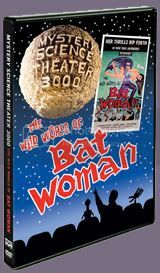 A sad attempt at cashing in on the popular Batman series, this film from 1966 features a crime fighter named Bat Woman who has an army of attractive young women called Bat Girls who are trying to obtain an atom bomb and prevent the evil Rat Fink from stealing it. The Wild World of Bat Woman is an unwatchable piece of garbage that should never have been committed to celluloid. The crew of the Satellite of Love (Mike, Crow, Tom Servo) identify this early on and rip the film to shreds. They comment how the film makes no sense and has scenes that seem like they are pulled from other films. The intro short Cheating is the real highlight here (and is for many episodes). Ridiculous 50s educational shorts are always the best material for MST3K and they do this one justice too. Though not one of the best episodes (I had trouble sitting through the feature), there is enough hilarity to make it worth a watch.